Doctor of Science, professor, corresponding member of International Academy of Informatization, Mugulsum Omarovna Nurmaganbetova is a head of department «Medical Biophysics, Information Technology and Mathematical Statistics». Candidate’s dissertation on subject: «Development of Information- technology Methods of Diagnosis and Formation Computer-aided System based on them» defended in Kazakh National University named after Al-Farabi in 1995, in 1999 awarded the lecturer title by occupation «Information Technology». Since 2009 she has the title of corresponding member in IAI. Author of scientific works more than 65, particularly 2 monographs: «Information-mathematical modeling of Diagnosis and Disease Prognosis» (2007), «Mathematical Modeling in Medicine» (2010), there are 5 certificates of authorship. She has published schoolbooks: «Elementary Information Technology in Medicine» (1997), «Basis of Higher Mathematics in Medicine» (2004). She has academic pursuits on the subject: «Mathematical modeling in Medicine» on the basis of Kazakh National University named after Al-Farabi. The physics department was founded on the 25th November of 1931 year with top ten departments of the institution. At the time of formation our department included 4 people (1 head of department, 2 teachers and 1 laboratory assistant). From 1931 to 1932 the physics department was located in the rooms of Kazakh pedagogical Institute, were had been conducted laboratory researches and read lectures. In the postwar period teaching and educational process carried on with 3 faculties students: therapeutic, pediatric and sanitation. 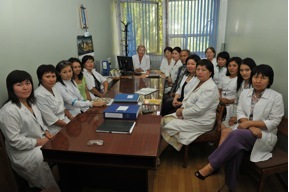 In the second half of 50th years with organization of correspondence courses and evening classes, also opening of pharmaceutical and stomatological faculties, educational process in the department became more diversified. In 1966 in the department was organized spectral laboratory, it could help employees to conduct educational process and scientific research works at the same time. The main subject was: «Definition of the contents of microcells in biological fabrics». In this period of time in the department was founded mechanical workshop for repairing instruments. In connection with introducing new Educational standards in 1975 were taught such disciplines like medical electronics and medical cybernetics for the second course students of therapeutic and pediatric faculties, also was entered new discipline like materials science with the obligatory laboratory researches for students of stomatological faculties. The department’s staffs work out all necessary materials for teachers and students. Head of department of Medical Biophysics, Information Technology and Mathematical Statistics in 1931-2012. Vsevolod Fedorovich Litvinov is a founder of department– Doctor of Physical and Mathematical Sciences, since 1931 up to 1934. Then Ismail Pavlovich Maslennikov– lecturer, was head of department since 1935 up to 1940; Petr Petrovich Lazarev– academician, director of biophysical laboratory of Science Academy of the USSR, was head of department since 1941 up to 1942; Nikolay Sergeyevich Akulov-academician, full member of Science Academy of Belorussian Soviet Socialist Republic, was head of department since 1942 up to 1943; Abram Aleksandrovich Sluckyi –academician, full member of Science Academy of Ukrainian Soviet Socialist Republic, was head of department since 1943 года up to 1944; Ismail Pavlovich Maslennikov-was head of department since 1945 up to 1954; Valentin Mikhailovich Kazachevskiy- lecturer, Candidate of Physical and Mathematical Sciences, academic secretary of Astro-Physical Institute of Science Academy of KazUSSR, was head of department of Physics since 1955 up to 1972; Zhumash Kudusovich Kudusov — lecturer, Doctor of science, was head of department since 1972 up to 1984; Berik Mukatovich Adibayev — professor, Doctor of Physical-Mathematical science, was head of department since 1984 up to 2008. From 2008 till today Doctor of Science, professor, corresponding member of International Academy of Informatization, Mugulsum Omarovna Nurmaganbetova is a head of department. Department employees actively participate in versatile scientific researches. Professorial teaching staff of department accounts 28 staff units, of them there are: 2 professors, 1 corresponding member of International Academy of Informatization, 8 candidates of sciences and 1 undergraduate. From 2006 the teaching process are continued according to Educational State Standards. Department employees worked out all necessary materials for teachers and students. Department employees was organizing activities are aimed at coordination of structural subdivisions activity of educational – methodic block on optimization, modernization of educational process in accordance with Bologne declaration principles. Model of graduate’s professional competency, based on competency-oriented approach to education has been worked- out by the department. Today the department are teaching disciplines like medical biophysics, computer science, mathematics, the biological statistics, information technology in public health services, the biological physics, medical electronics, programming of medical and biologic processes, numerical methods of the analysis for students of 1rd, 2rd and 3rd courses. There are 8 computer rooms, 4 educational-laboratory rooms and 6 educational rooms. Educational process includes widely modern methods of teaching and control. 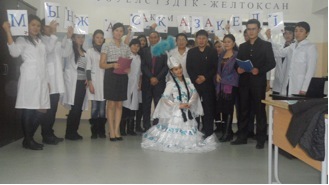 Scientific research work of department conducted individually, according to the initiative scientific programs and based on other high schools (KazNU named after Al-Farabi, Almaty State University named after Abai and etc.). Department constantly works with students of scientific group. They are working according to subjects which were defined by scientific interest of teachers. Scientific researches of the department basically devoting for using medical biophysics, information technology and mathematical statistics in medicine. Scientific works of students which were prepared in the department, annually noted at conferences. In addition, within the frame of the Scientific Day, a student of 1rd course of General Medicine faculty Panarbek Gulnaz with subject «Macromedia Flesh programmasynyn comegimen dayindalgan electrondyk okulyk» have been won first place on competition “Student and scientific and technical progress ” at the University in 2009. (research supervisor, teacher Barakova А.S.). Department conducted educational researching works with students, they are using interactive technology for preparation presentation and analyzing medical access based on special statistical program. Department have been responsible for social educational work with students of “General Medicine” and “Management in Public Health and Pharmacy” faculties. Social educational work in department is carried on in accordance with the submitted plan. There are conducted various social useful labours. For example, within the frame of “Kazakhstan 20 year of independence” were carried out open lessons on subjects «Tauelsizdyk – Zheltoksannyn jemisi» и «Tauelsizdyk — tugyrym». Students visit places of interest in Almaty. All department’s employees are responsible for public commissions and actively participated in University’s life. They have social commissions in faculty areas as well as in University areas.